Complete ouija board instructions and Rules. Well, Ouija board instructions are pretty straight forward. First you will need a Ouija board. There are many places which sell these in shops and over the internet. They are not difficult to find. The next thing you need to do is to set the board up in a location which you suspect is haunted. Please note that at least two people are needed in order to use a Ouija board. Of course any type of indicator is fine as long as it can accurately define the markings on the board. The participants then take it in turns to ask any spirits in the area questions. 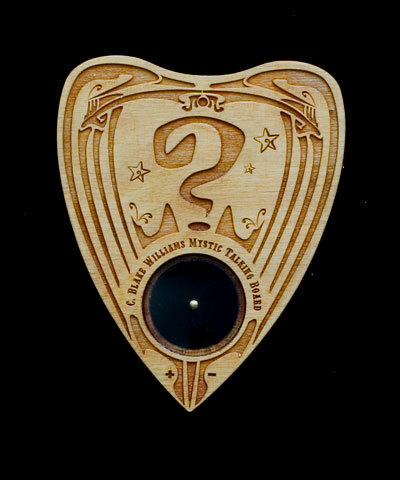 If a connection is established then the planchette should begin to gently move towards a marking on the board. The participants should be careful not to push the planchette themselves and also not to put to much pressure on it. If the act is taken seriously and the area is in fact inhabited by a spirit, there is a good chance that some kind of phenomena will be experienced. One of the most common questions about Ouija boards is "Do they actually work". Well, I'm sorry to give such a vague answer, but this goes along the same lines of do ghosts exist. I personally believe they are not to be messed with. If the act is taken seriously and done properly, the chance of something happening is much higher than if its done by someone just looking for a scare. One of the things to be careful of however is letting something through. What i mean by this is that the whole point of doing a Ouija board is to make contact with the dead. If contact is established then this opens a kind of "path" between the participants and the spirit which is were the communication runs through. Some people believe that it is not only communications that runs through these paths but sometimes, whatever is being communicated with can slip through and this becomes the classic haunting or possession story. Whether you choose to believe this is possible is, of course, completely up to you but please not that if your thinking of trying a Ouija board, the amount of story's were things have gone wrong with them is massive. They are the most feared spiritual tool there is, which many would say is for a good reason. If you choose to follow these Ouija board instructions and go ahead and try one for yourself, well that's up to you, but please, be sensible about it.